Days afta di ruling All Progressive Congress announce say e don adopt senator Ahmed Lawan as senate president for di ninth Assembly, gbege don dey shele for di party. Even sef, di current holder of di position, Bukola Saraki no win re-election on 23 February general election for Nigeria, so im no dey come back, and again, unlike 2015, APC get ogbonge majority for dis 9th National Assembly of 2019 pass di 8th for 2015. Oga Lawan di represent Yobe north Senatorial district and e be di senate majority leader for di 8th Senate. Na very high ranking senator and even for 2015, di party bin support am to be senate president before, oga Bukola Saraki do am Maradona style. One of dem na di ranking senator wey dem di call Ali Ndume. E dey represent Borno south. Ndume claim e dey bad for di party to bless one candidate from di North east for di job. E say im don dey loyal to di party and dat e for good make di party allow everybody contest and whoever wins, odas go support am. Oda strong men wey di join di battle for senate president na Orji Uzor Kalu wey be former governor of Abia state. Orji say e dey very unfair say di party for dii zoning no give any position to pipo from di South east. E say di President from north west, di Vice President from south west, di Senate President dem don zone am to north east and di deputy from north west. And as e be now, pipo from di South east no get anything, Kalu tok. E say at least make di party give am Deputy Senate president if not, im go contest for di position of di Senate President. Anoda interesting character to watch na Senator Danjuma Goje. E be Governor of Gombe State from 2003 to 2011 and report say e don dey lobby some powerful pipo for di party structure to support am. Goje, wey dey represent Gombe central senatorial district for senate, move to APC from PDP for 2014. Goje be di Chairman of Senate Committee on Appropriation and he think say im full ground gidigba to become di senate president. Some analysts dey fear say if di ruling APC no manage dis crisis well, e fit affect dem even though dem get di majority for senate. 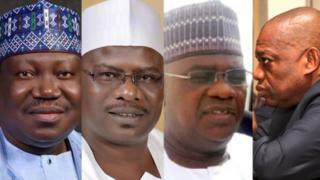 For 2015, APC bin anoint Ahmed Lawan to become Senate President but Senator Bukola Saraki bin do di party Maradona. Dat time Saraki believe say those of dem wey join epp di party win no get any benefit. E join force wit PDP come become di Senate President. Wit di way tins dey go, some analysts believe say if di party no try solve dis kasala wey dey ground, yawa fit gas as di opposition party don di encourage dia members to contest for di positions.